It's sad to hear that cartoonist Richard Thompson suffers from Parkinson's disease, and touching when other cartoonist unite to create something special out of it. 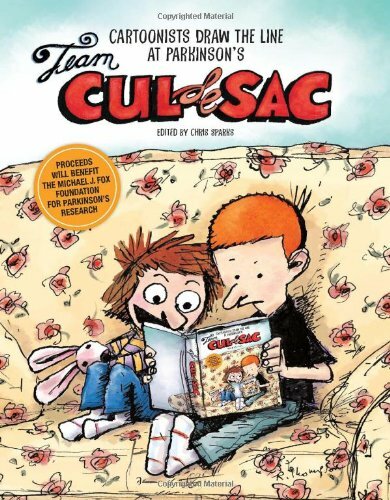 This book is the result of a fundraising effort launched by Chris Spark, friend of and webmaster of Richard, called Team Cul de Sac. Cartoonists were invited to create art using Cul de Sac characters. The goal was to raise $250,000. The money would go to Team Fox, the grass-roots fundraising arm of the Michael J. Fox Foundation. Some of the cartoonist who contributed are Bill Amend, Jim Borgman and Jerry Scott, Jim Davis, Cathy Guisewite, Rick Kirkman, Patrick McDonnell, Pat Oliphant, Stephan Pastis, Bill Watterson and many more. It's quite cool to see how other cartoonists and artists draw the Cul de Sac characters and come up with gags. Each artwork also comes with a quote by the artist on what they feel about Richard Thompson and his work. The book's a 144-page hardcover and available in Amazon Kindle format as well.